Earlier this year (August 5th 2014) I reported that London Palestine Action, a network of people in London taking creative action against Israeli apartheid through Boycott,Divestment and Sanctions (BDS) began a roof-top demonstration at Shenstone, Staffordshire where parts are produced for military drones. 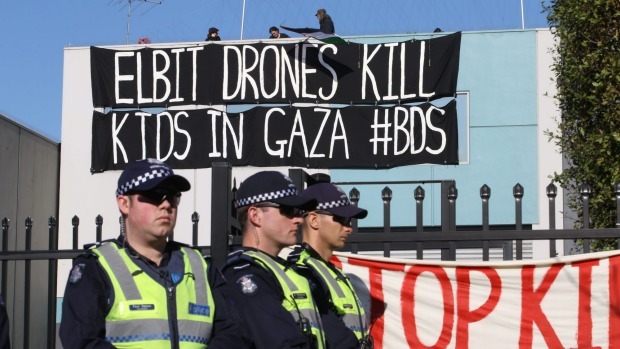 Brazilian activists protested to prevent the deal over Elbit’s role in the construction of Israel’s illegal apartheid Wall in the occupied West Bank going ahead. Campaigners also pointed out what they alleged was a close relationship with the Israeli military. Campaigners welcomed the decision of the Rio Grande do Sul government which was keen to point out that they had taken notice of the social movements involved in action against Elbit and the importance of upholding human rights and the promotion of peace.